Thoughts turn to romance at Rock Center this week, with Valentine's Day gifts, dates and sweets at every turn. If you're making last-minute plans, check out some of our favorites below. And of course, if you're looking to get together with friends or make a bold, independent outing, there's plenty to love on the way. Kicking off V-Day early, the ultra-hip Kinfolk pop-up bar (with roots in Tokyo, LA and Brooklyn) comes to the Rainbow Room Gallery on February 13. Expect DJ sets, cocktails like the Cupid Deluxe and Ginger Trip, and a cool crowd, not to mention those 65th-floor views. There are no reservations, so while the event runs from 5pm to midnight, arriving well before 8pm is your best bet to make it inside. Also on Wednesday night, The Sea Grill hosts a Taittinger Champagne dinner at 6:30pm. One of the hottest tickets in town is SPHERES, the award-winning VR experience of the cosmos, showing exclusively at Rock Center through March 3. Though nighttime screenings have sold out for Valentine's Day, afternoon spots may still be available. Purchase tickets here. Top of the Rock always inspires as a date destination (and romantics love to pop the question on the observation deck), plus, after sundown you'll see the Empire State Building aglow with "heartbeat lighting." Purchase advance tickets here—especially recommended for sunset hours. The beloved Rink at Rockefeller Center will have a red heart painted on top for Valentine's Day, and reservations to skate are still available. Also check out skating and dinner packages with Rock Center Café and The Sea Grill, which are serving special menus for the occasion. Steaks at Del Frisco's Grille and champagne pairings at Morrell Wine Bar & Café are more ways to make your honey happy. 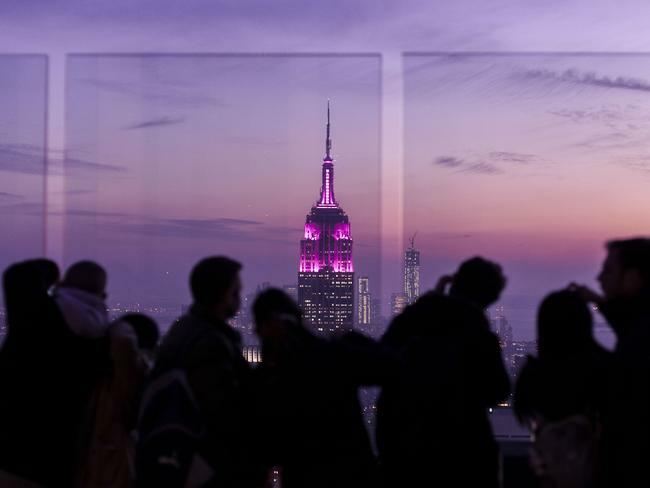 And keep the mood going all month long with visit to sky-high Bar SixtyFive or the Rainbow Room's pop-up Bae Bar, where you'll find flirty cocktails and bites on February 18, 22 and 28. Head here to make reservations. Strolling the Channel Gardens is lovely this time of year (see a map of Rock Center), and a crochet heart backdrop in the Concourse, along with eye-catching art by Hein Koh, also make for a great Insta moment. Plus, for some lighthearted fun, take a behind-the-scenes tour of NBC Studios, have some laughs making a late-night clip together, and take home a memory to keep. Happy Valentine's Day!